1 God be gracious to us, and bless us, And cause His face to shine among us; Selah. 3 Let peoples give Thee thanks, O God, Let peoples, all of them, give Thee thanks. 4 Let tribes rejoice and shout aloud, For Thou wilt judge peoples in equity, And tribes on the earth wilt Thou lead. Selah. 5 Let peoples give Thee thanks, O God, Let peoples, all of them, give Thee thanks. 6 The earth has yielded her increase: May God, [even] our God, bless us! 7 May God bless us, And may all the ends of the earth fear Him! This little psalm condenses the dominant thought of the two preceding into a series of aspirations after Israel's blessing, and the consequent diffusion of the knowledge of God's way among all lands. Like Psalm lxv., it sees in abundant harvests a type and witness of God's kindness. But, whereas in Psalm lxv. the fields were covered with corn, here the increase has been gathered in. The two psalms may or may not be connected in date of composition as closely as these two stages of one harvest-time. 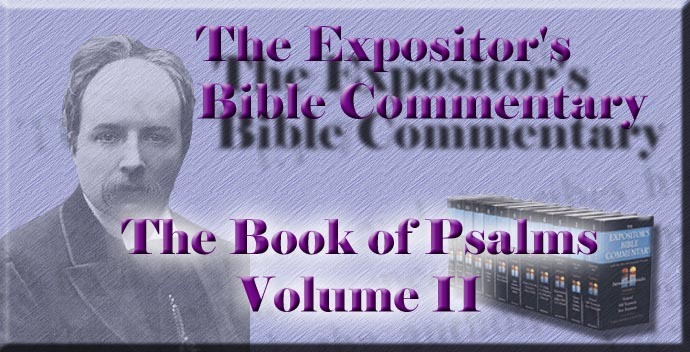 The structure of the psalm has been variously conceived. Clearly the Selahs do not guide as to divisions in the flow of thought. But it may be noted that the seven verses in the psalm have each two clauses, with the exception of the middle one (ver. 4), which has three. Its place and its abnormal length mark it as the core, round which, as it were, the whole is built up. Further, it is as if encased in two verses (vv. 3, 5), which, in their four clauses, are a fourfold repetition of a single aspiration. These three verses are the heart of the psalm--the desire that all the earth may praise God, whose providence blesses it all. They are again enclosed in two strophes of two verses each (vv. 1, 2, and 6, 7), which, like the closer wrapping round the core, are substantially parallel, and, unlike it, regard God's manifestation to Israel as His great witness to the world. Thus, working outwards from the central verse, we have symmetry of structure, and intelligible progress and distinctness of thought. Another point of difficulty is the rendering of the series of verbs in the psalm. Commentators are unanimous in taking those of ver. 1 as expressions of desire; but they bewilderingly diverge in their treatment of the following ones. Details of the divergent interpretations, or discussions of their reasons, cannot be entered on here. It may be sufficient to say that the adherence throughout to the optative rendering, admitted by all in ver. 1, gives a consistent colouring to the whole. It is arbitrary to vary the renderings in so short a psalm. But, as is often the case, the aspirations are so sure of their correspondence with the Divine purpose that they tremble on the verge of being prophecies, as, indeed, all wishes that go out along the line of God's "way" are. Every deep, God-inspired longing whispers to its utterer assurance that so it shall be; and therefore such desires have ever in them an element of fruition, and know nothing of the pain of earthly wishes. They who stretch out empty hands to God never "gather dust and chaff." The priestly blessing (Numb. vi. 24-26) moulds ver. 1, but with the substitution of God for Jehovah, and of "among us" for "upon us." The latter variation gives an impression of closer contact of men with the lustre of that Divine Light, and of yet greater condescension in God. The soul's longing is not satisfied by even the fullest beams of a Light that is fixed on high; it dares to wish for the stooping of the Sun to dwell among us. The singer speaks in the name of the nation; and, by using the priestly formula, claims for the whole people the sacerdotal dignity which belonged to it by its original constitution. He gives that idea its widest extension. Israel is the world's high priest, lifting up intercessions and holy hands of benediction for mankind. What self-effacement, and what profound insight into and sympathy with the mind of God breathe in that collocation of desires, in which the gracious lustre of God's face shining on us is longed for, chiefly that thence it may be reflected into the dark places of earth, to gladden sad and seeking eyes! This psalmist did not know in how true a sense the Light would come to dwell among men of Israel's race, and thence to flood the world; but his yearning is a foreshadowing of the spirit of Christianity, which forbids self-regarding monopoly of its blessings. If a man is "light in the Lord," he cannot but shine. "God hath shined into our hearts, that we may give the light of the knowledge of the glory of God." A Church illuminated with a manifestly Divine light is the best witness for God. Eyes which cannot look on the Sun may gaze at the clouds, which tone down its colourless radiance into purple and gold. The central core of the psalm may either be taken as summons to the nations or as expression of desire for them. The depth of the longing or the stringency of the summons is wonderfully given by that fourfold repetition of the same words in vv. 3 and 5, with the emphatic "all of them" in the second clause of each. Not less significant is the use of three names for the aggregations of men--nations (ver. 2), peoples, and tribes. All are included, whatever bond knits them in communities, whatever their societies call themselves, however many they are. The very vagueness gives sublimity and universality. We can fill the vast outline drawn by these sweeping strokes; and wider knowledge should not be attended with narrowed desires, nor feebler confidence that the Light shall lighten every land. It is noticeable that in this central portion the deeds of God among the nations are set forth as the ground of their praise and joy in Him. Israel had the light of His face, and that would draw men to Him. But all peoples have the strength of His arm to be their defender, and the guidance of His hand by providences and in other ways unrecognised by them. The "judgments" here contemplated are, of course, not retribution for evil, but the aggregate of dealings by which God shows His sovereignty in all the earth. The psalmist does not believe that God's goodness has been confined to Israel, nor that the rest of the world has been left orphaned. He agrees with Paul, "That which may be known of God is manifest in them, for God manifested it to them." The final strophe (vv. 6, 7) is substantially a repetition of vv. 1, 2, with the addition that a past fact is laid as the foundation of the desires or hopes of future blessings. "The earth has yielded her increase." This may show that the psalm is a harvest hymn, but it does not necessarily imply this. The thought may have been born at any time. The singer takes the plain fact that, year by year, by mysterious quickening which he recognises as of God, the fertile earth "causes the things sown in it to bring forth and bud," as an evidence of Divine care and kindliness, which warrants the desire and the confidence that all blessings will be given. It seems a large inference from such a premise; but it is legitimate for those who recognise God as working in nature, and have eyes to read the parables amid which we live. The psalmist reminds God of His own acts, and, further, of His own name, and builds on these his petitions and his faith. Because He is "our God" He will bless us; and since the earth has, by His gift, "yielded her increase," He will give the better food which souls need. This the singer desires, not only because he and his brethren need it, but because a happy people are the best witnesses for a good King, and worshippers "satisfied with favour and full of the blessing of the Lord" proclaim most persuasively, "Taste, and see that God is good." This psalm is a truly missionary psalm, in its clear anticipation of the universal spread of the knowledge of God, in its firm grasp of the thought that the Church has its blessings in order to the evangelisation of the world, and in its intensity of longing that from all the ends of the earth a shout of praise may go up to the God who has sent some rays of His light into them all, and committed to His people the task of carrying a brighter illumination to every land.